Sign of hair thinning which people usually notice is more hairs than usual left in the hairbrush after brushing or in the basin after shampooing. Hair thinning has become a vital issue for both sexes. Nowadays the problem which everyone faces is thinning of the hair. Hair thinning can be caused due to An unhealthy scalp environment and few more things like regular stress, unbalanced diet, and hormonal changes etc. 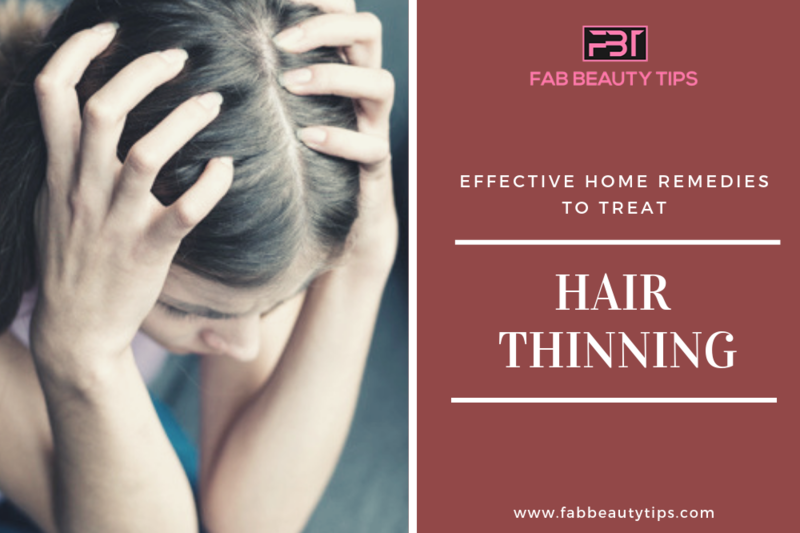 However, hair fall or hair thinning can be easily prevented by following the home remedies which can be very helpful to everyone. Slice the aloe vera gel and then extract the aloe gel from it. Blend the gel to make a smooth paste. Massage the aloe gel on your hair gently. Leave for about 20 minutes and then wash with warm water. Aloe vera is known to heal and repair the dead cells and provides strength to the hair. There are many Aloe vera benefits for hair which very few people know like helping in hair growth, giving hair shine and many more. Mix one egg and a teaspoon of olive oil in a bowl properly in order to make a smooth paste. Apply this mixture on your scalp from roots to the tips. Cover with the shower cap. Use the cold water to wash your hair and also condition your hair with the conditioner. Eggs contain proteins which provide strength to the hair. Make a lump free smooth paste by mixing a ripe banana and avocado together. Cover with the shower cap and then wash off your hair with the cold hair. Avocado has many health benefits, along with banana, it conditions the hair. Prepare a mixture of amla powder and the lemon juice. Apply this mixture on your scalp and leave for about 20 minutes. Allow it to get dry. Amla contains anti-oxidants and vitamin C which increases hair growth. While there are many more Amla benefits for hair which you must know like helping in hair growth, prevent graying of hair and many more. Soak the fenugreek seeds in water and leave overnight. Blend the seeds along with some water to make a smooth paste. Apply the mixture on your scalp and then leave for about 30 minutes. Fenugreek seeds help to maintain the health of your hair. Make a paste of henna leaves and water. Apply this paste on your scalp and then leave for about 3 hours. Cover your hair with shower cap and then rinse your hair with cold water. Henna helps in balancing the pH and gives a natural color to your hair and also the strength to your hair. Warm 2 tbsp coconut oil in a bowl. Massage the oil into your scalp. Massage your scalp for 15 minutes and leave for about 30 minutes. You can leave for overnight as well. Coconut oil promotes the hair growth and also conditions your hair. Brew a cup of green tea and then allow it to cool. Pour the green tea onto your hair and then gently massage with your fingers. Leave it for an hour and then wash with water. Green tea consists of many anti-oxidants which help in fighting against the damage causing free radicals and also provides strength. With the help of a cotton pad apply the witch hazel onto your scalp. Leave it for about 10 minutes and then wash your hair with water. Witch hazel helps in unclogging the pores and prevents dandruff. Massage on your scalp and then leave for about 15 minutes. Take one cup curd in a bowl. Apply on your scalp and then gently massage your hair. Leave for about 15 minutes and then wash with water. Curd helps in conditioning the hair and also it helps in hair growth. Apply the ground shikakai onto your scalp. Shikakai scrub is popular for the hair cleansing property. It helps in the hair treatment. You can take the soap nut (reetha) in the soap form and then apply on your scalp. Soap nut also known as reetha is an Asian fruit which has anti-microbial properties which prevent hair loss. Take ½ cup apple cider vinegar. Pour onto your scalp and then gently massage with your fingers. Leave for about 15 minutes and then rinse off. Apple cider vinegar helps in keeping the scalp clean and also accelerate the hair growth. Grind the curry leaves in order to make a smooth juice. Apply this juice on your scalp. Leave for about 20 minutes and then wash with cold water. Curry leaves improve the hair growth and remove itching. Thinning of hair can be a major problem but we can get rid of such problem by using the above home remedies as these help in providing the hair growth as the remedies given above contains many essential herbs etc which are quite helpful in hair growth. Do leave your comment below and let me know how this article helped you and do share it with your friends too. Love the list of natural products you’ve shared, Roshni. Most of them are available at home, so we should have no excuse not to use them to stop hairfall and reverse the problem of thinning hair. Wow this is a wonderful post. Such useful and easy to follow tips for such a rampant problem. Thank you so much for sharing this post. Aloe Vera and eggs are the easiest and one of most effective way to get healthy hair. I generally use these two together. Hair thinning is a very common problem with everyone. I liked your simple DIYs at home, especially fenugreek seeds and aloe vera. Shall try out. Hair fall is one of the most common problems we face today.This is really the wonderful and simple ways through which we can treat the condition. I am facing terrible hair falling these days.. I do apply eggs , fenugreek paste on my scalp but nothing is working great.. This post is gonna helpful for me at least.. Thanks for sharing.. This post is really very helpful I am suffering from severe hair fall and now I will definitely going to follow everything mentioned here. I normally do a good hair care routine during weekends for the time they take. But these are some easy and manageable tips, I am bookmarking this page for future. This post is bookmarked for me now. I would love to try Fenugreek seeds and Aloe vera. Can I use both of them, as per the directions you gave or I need to use only one at a time? A very helpful post. I love the fact that all the home remedies shared by you is easily available and loaded with natural goodness. I am using aloe vera for quite some time, It has shown positive results. Thanks for sharing. my hair is falling like crazy. I tried so many things but nothing worked really. I’ll try these treatments out, hopefully, they’ll help. Thanks for sharing. These are natural ways to deal with hair issues, I am honestly gonna try these my hair are in bad shape. They are falling and I am looking for a natural way to deal with the issues. Before saying anything, hat’s off to the amount of research you would have done for this amazing blog, I just loved it, it is damn helpful I am definitely bookmarking this right away, thank you for sharing!